We now have a Clubhouse! God has provided us with our own Clubhouse. We have worked very hard to get it ready for the Open House on February 23rd! Thanks to Sagemont Church and its generous members’ and friends’ support and prayers, we now have a home base for our ministry. 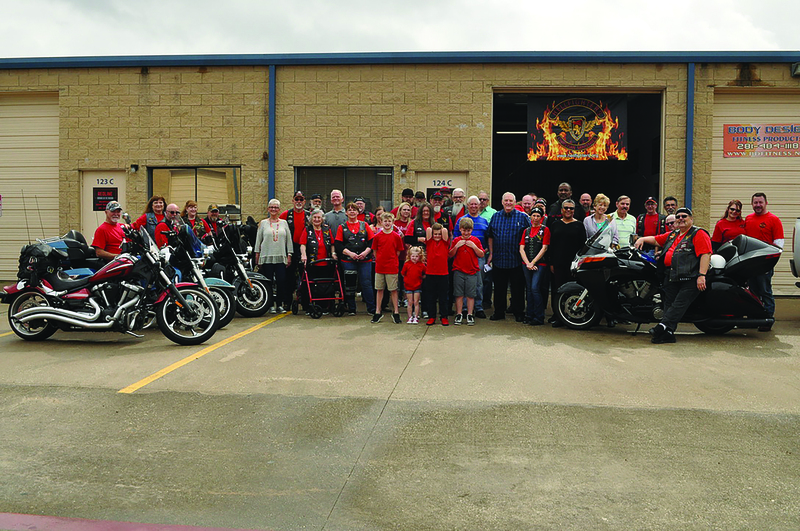 A month after this announcement was sent out, over 125 people attended the Open House for Southeast Houston Hellfighters’ (SE Houston HF) Motorcycle Ministry. Fifty percent of the attendees were from other HellFighter units, including all three Texas units as well as two units from Mississippi. The other 50% came from the local community, including many from Sagemont Church. Joe Massa, Sagemont Church member for the past 25 years, shared his first hand account of the SE Houston HF Open House, after attending with his wife, BJ Massa, who took photos for this article. David Cohoon, Sagemont member and President since 2015, is very excited because his Houston chapter of the HellFighters’ (HF) Motorcycle Ministry is having its grand opening today for their new HF Clubhouse! This is not your ordinary motorcycle club. This gang has one major agenda…to lead lost people to the Lord and Savior Jesus Christ! By 10:00 am the HF club members put the final touches for the grand opening just as guests and friends began to mill around the open garage door in the business park located off the Gulf Freeway just South of Beltway 8. A dozen big, beautiful motorcycles were parked outside the front entrance. Inside the neatly organized facility, you could feel the excitement in the air and the presence of the Holy Spirit. Inside the multipurpose building there are shelves with large plastic totes labeled with dozens of kinds of toiletries and other necessities that the club puts together for their outreach to the growing number of homeless people living in the area. The group rides to Galveston once a month and ministers to the homeless there. The HFs don’t just give handouts; there are also plastic totes full of tracts that they use to help them lead people to the Lord. They plan to ride up to the Michigan/Canada border in June and then next year to Washington DC to pray for our politicians in front of the White House. Each year the group rides up to Sturgis, South Dakota to minister to the biker community during the largest motorcycle rally in the world. The HFs had been without a permanent club house for over a year and now they plan to utilize this space to the fullest possible extent for the Lord. David spoke about all the things he intends to use this facility for. There is a men’s group starting in March and plans for a women’s group to follow. A prayer box is planned to be put just outside the front door. The facility will be open to other groups for ministry meetings also. You don’t have to be a motorcycle rider to join this club. Jeanette Rodriguez, AKA “Granny R”, is David’s 93-year-old mother and she fits right in with her black leather vest. She explains that she is a “Foot Soldier” member of the club. Foot soldiers perform important tasks like going out on outreach trips, helping organize functions at headquarters, pulling the support trailer on motorcycle trips and just hanging out with this really cool and godly group of people. Everyone is welcome here and the HF will find a place for anyone who has a heart for the Lord. Raul Yzquierdo, AKA “Primo,” the Sergeant-at-Arms, is a quiet man who serves the Lord in a mighty way. Raul appears like a tough guy with an intimidating look, but he has a gentle speech and has an amazing heart for the Lord. He leads the HF’s prison ministry. There was a bit of a stir, when a silver-haired man with a ZZ Top beard arrives. It’s Mike Grubb, the national president of the HF club from Laurel, MS. After greetings from fellow members, Mike explained in the clearest, most genuine way what the HFs are all about. Mike said, “It’s amazing how little you have to do to minister to other people. All you have to do is make yourself available and God will do the rest…All we are is the hands and feet of Jesus.” I listened in amazement as Mike shared his testimony that was like so many who now called themselves HF. As a result they can go into desperate, hopeless places and feel comfortable showing Jesus’ love to people in some pretty tough places like the homeless camp under a bridge and give the hope of Jesus Christ to people who really need it. David then led a group prayer and blessed the food, pulled pork and sloppy joes, inside the newly remodeled office space. The food was honest, simple and filling, just like the club members. No fluff here, this is the ultimate man cave, but you can tell thoughtfulness was put into the many cool posters and decorations hung on the walls of the clubhouse. It’s the kind of refuge that one could just hang out in and feel safe and comfortable and serve the Lord at the same time. Then everyone gathered outside for a group picture. “Snickers” tells my wife, BJ, who was the photographer, to include two particular motorcycles in the picture. Snickers happily announced, “Now these are some real motorcycles,” he was immediately heckled and told to get in place for the picture. The camaraderie of the group speaks of their closeness. Five 26-ft-long U-haul trucks full of furniture was delivered to a group in need in Galveston. 36,000 miles were added per motorcycle which includes Ride Across America For Jesus and a mission trip to Sturgis, South Dakota. 33+ events were organized and or participated in. This includes homeless, homeless veterans, prison, youth groups, women’s shelter, community outreach, hospital visitation and, of course, the biker community. They also ministered to the needy with donations of socks, shirts, pants as well as food. If you would like to learn more about SE Houston Hellfighters, contact them at the Club House 281.741.0012 or 832.274.7213.